As expected, the line of cars running bumper to bumper disappeared over the horizon. From Norland to the Haliburton Highlands, people drove by at turtle speed. The OPP were in force as promised. I spotted two smokies in the bushes. I had deliberately set the speed control at the speed limit so no worries on my part. I stopped in at Coboconk and pick up my groceries. The bill came to just under $170 for some veggies, fruit, a couple of prepared meals, ice, fire wood and starter fluid. This is the time of year these businesses make their money! Back on the road Taboo (my Moluccan Cockatoo) was merrily twirling around upside down in his cage. Once in a while he would break into song of different variations of ‘hello.’ He knew we were on an adventure again. I finally arrived at base camp and checked in while retrieving the key to the gates. I had previously decided to eat at base camp before heading out. After a so so small 6 oz. steak, a Smirnoff and baked potato, that bill came to almost $40. With my belly full I made my way to 1.05 marker. The site was not the one I was at last year. Instead I was a small plot tucked in between to permanent leased properties. I was disappointed as the views aren’t as good and no way to get to the water without climbing down a steep slope. Now a generator is humming along next door. At least they have power. I started to unpack my camping equipment and decided I had better start with the kitchen stand. I opened the metal case only to smell that distinct order of pee and mouse turds! I don’t know how on earth they got into the case, but there was insulation and crap everywhere. It’s a metal case for god’s sake. I might just have to toss my great little stand. I managed to get the tent erected and decided I should maybe inflate my bed. Both the generator and the spare car battery were toast. Bob thought as much when he tried charging them. So tomorrow I will have to go into town and buy a 12 volt battery so I can sleep in the tent and charge my inventory of electronics. Bob said that I might just have to stay off the grid for the week. Well he might prove right as cell phone service is spotty. There is no wireless internet but I do like my laptop for typing on and watching the odd movie by the fire. Zoey jumped into the lake when I took her down to the boat ramp. But as I type, her teeth are chattering with cold. I put her winter Shedrow blanket on to warm her a bit. She isn’t eating either. She has been off the past few days so I’m not sure what is going on. Deliverance on the other hand wasn’t sure of the water thing. He looked puzzled about it all. He never even put a paw in the water. Give im a couple of days and I hope I can convince him it isn’t that bad. After all he is half Lab. There is very little room for a parrot and two large dogs. This going to bed early is tough, especially when I forgot my sleep meds and Advil. I read as best as I could from the dim light of my battery operated table lamp. I didn’t want to use the truck lights as it is the only live power source I have on board. The dogs were restless and both vying for a good spot on my fold out back seat bed. Try as I might to sleep, I was still awake by midnight. My back was really giving me grief as the bed doesn’t lay totally flat. It was leaning a bit towards the floor so I was slowly rolling in that direction. On went the TENS machine for 20 minutes. Ah…. That felt better. It was hot in the truck with all these bodies. I had saved some mosquito netting and rolled the window down stuffing the netting in the opening. Fresh air at last. By morning I found myself partly on the floor with my arms touching the mat and my head not far behind still clutching the pillows. Two dogs stretched out on the rest of the bed looking very fresh and relaxed. For sure I’m on a hunt for a battery today. It was 10 am before I managed to stumble out of the truck. I made a dash for the outhouse. If I had been in the other more secluded site, I could just squat behind a tree. This is going to be a problem when I take my water pills. They make a trough for women when in the outdoors so you can stand up and just pee like a man. It might be worth the investment. Noisy, noisy, noisy… The logging trucks are running by every 10 minutes, along with the dump trucks hauling gravel I presume to fill the eroded parts of the road leading into the camps. The road is just a mere 30 feet from my site. I was on another site a few years back having to deal with the interruption of quiet peace I’m so desperately seeking. I vowed I would never go back. Chain saws buzzed all day long. If this keeps up, I might just take my laptop and go on a trail; find a nice flat rock and click away at my computer. This is awful. It is a constant barrage of rumbling diesel engines as a parade of heavy trucks bang and bump their way by my tiny spot in the woods. I was successful in my shopping today in Minden. I got a new car battery and it instantly worked when I got back to camp and tried it out. Hurray!!!! I even got $15 off for donating my dead recycled battery. I picked up some canned dog food to see if Zoey Pearl will eat that. Her teeth are bad and in need of removal. I think that is part of the problem. As for Deliverance, he could care less. He ate Zoey Pearl’s breakfast too. I also got a dish washing pan and firewood. Now between on the kindling and real logs, I should have some roaring campfires the next several nights. I stopped in at the Kawartha Dairy and order some Cherry Bordeaux ice cream. They don’t make banana splits anymore so I had to settle for a cone and two extra dishes for the dogs. Deliverance wasn’t quite sure what to do with ice cream. But eventually he tried it and licked and slurped away. Zoey of course finished hers and Taboo had a bit of cone. It was off to the camp once again. I’m really excited to have my bed in the tent tonight. I’ll probably leave Zoey in the truck and just have D with me tonight. She gets so cold in the tent. I have a coat for D so I might just put one on him as well. It is cool and over cast but at least it isn’t raining like last year! (I better not say that too loud.) I think the cooler temperatures are even keeping the bugs at bay. I’m just going to start dinner on my faithful Coleman stove and grill. I love this little stove. Coleman makes the best. Tonight I’m having veal parmesan with pasta. For tomorrow’s menu, I’m on to Chicken Alfredo in cream sauce. Everything tastes better outdoors. And the Merlot is perfect. I watched a movie last night by the campfire and then retired to my tent with D. I put Zoey’s coat on and left her to guard the truck with Taboo. I read for a while before extinguishing my lamp and pulled the covers over my shoulders. It was comfy and warm. So wonderful to have my Queen’s size bed again, this time only sharing it with D.
I woke several times in the night to Zoey Pearl’s thumbing in the truck; her bear bells tinkling. She is a restless sleeper as she repositions herself several times making sure everyone knows it. The bull frogs were at it as well with their deep throated double bass signaling for a mate. Finally I drifted off to the silence blackness of the night. I awoke at 7 am and proceeded to visit the loo before anything else. I cooked a big breakfast for the dogs, Taboo and I. It consisted of eggs and bacon, toast with peanut butter, orange juice and coffee. Everyone enjoyed samplings from my plate. Taboo of course loves his toast with peanut butter and the dogs devoured the bacon and eggs. After I fortified my body with food, the dogs got their second entre: dog food. Zoey Pearl was in a playful mood so I tossed her a stick in the water several times. She was very deliberate in her retrieves. Her swimming has much improved and I feel Coco’s spirit guiding her through the water. How I miss Coconut. 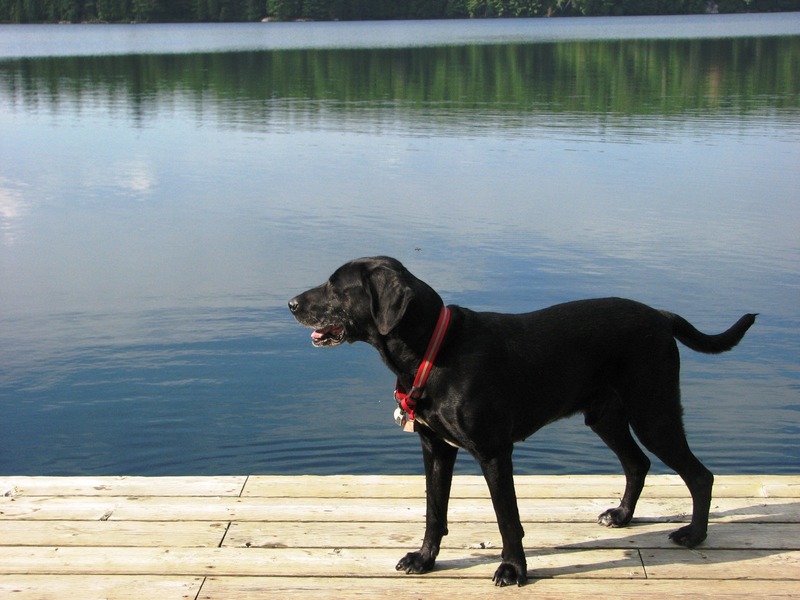 It was then I decided to go to the launch area where Coco had his last dives from the dock into the warm water of Lake Macdonald. I removed my Crocks and socks; rolled up my pant legs and proceeded into the water. I was trying to coax D in and see if he would retrieve. 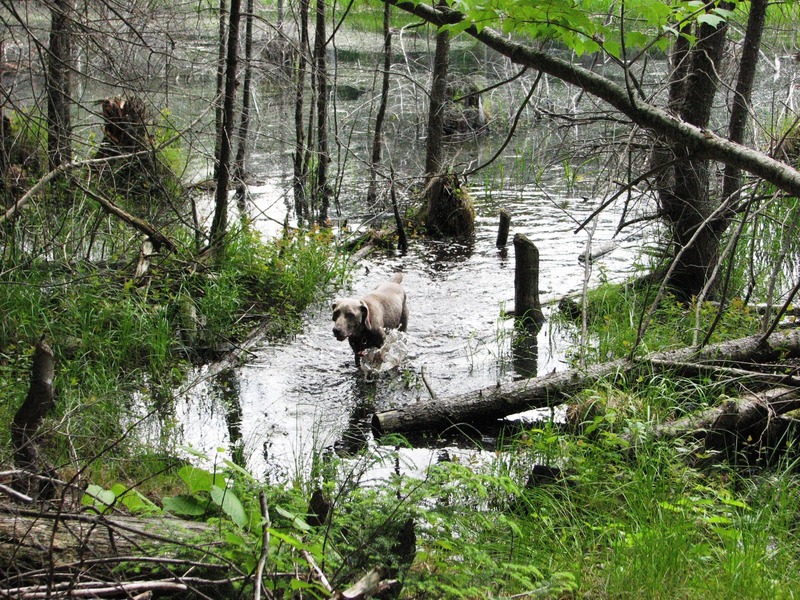 With intrepidation he slowly walked into the water with the lure of a knobby stick. It was a bit embarrassing to see such caution from a dog who is half Labrador Retriever. Still I can understand his reluctance to water since he probably has never seen a lake before. How sad. The best I could do was to get D to go as far as his chest. He is very much like me. If we can stand up that means it is safe. I can relate to his fear of the bottomless deep waters. Drowning is not on my list of things to do. After a spicy bowl of chili, the dogs and I headed out for walk on the Nordic Trail, soon followed by the Dog Trail. 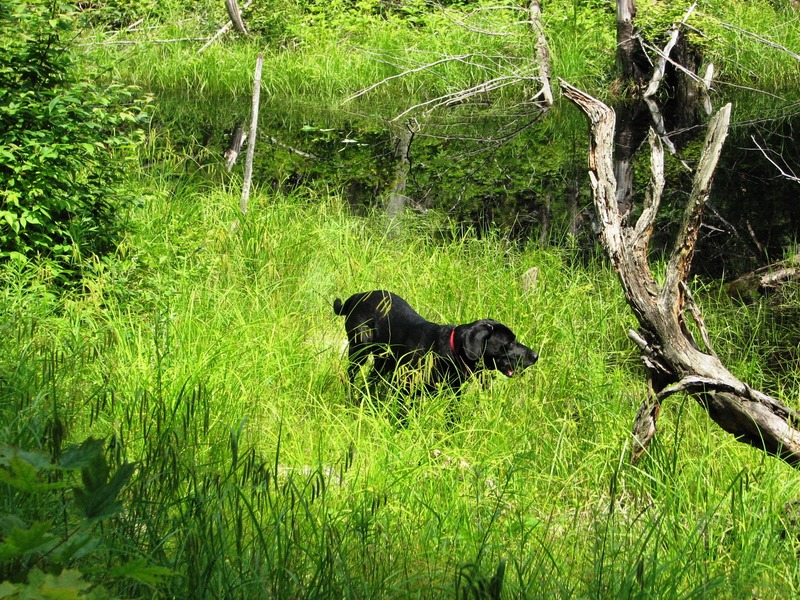 This would be first off leash trail walk. 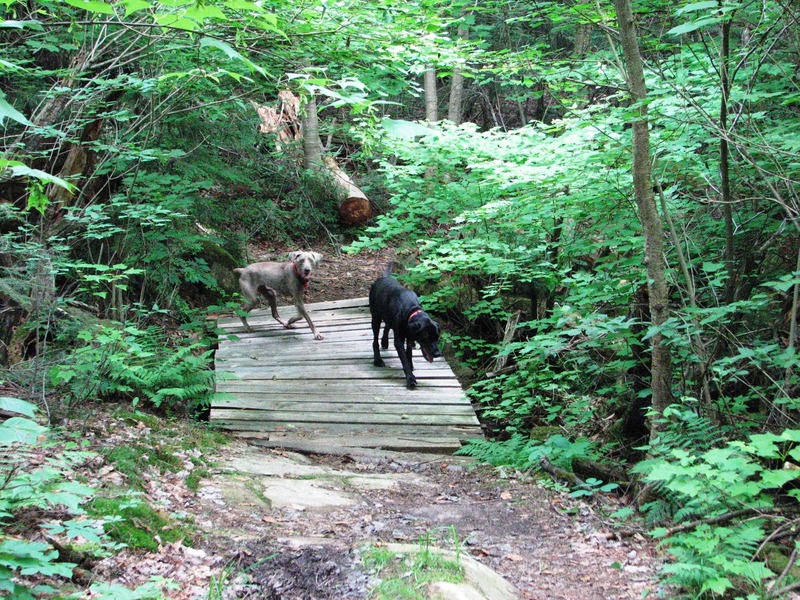 After a few minutes of keeping him on leash, he soon followed Zoey untethered for the remainder of our 2 hour hike in the bush. The trail would take us up inclines of rock and boulder, on swamp-like foot trails; passed marshes and through some dense brush. I had my new ThermaCell mosquito repellant hooked securely to my hip. This would be a real test to see how good this propane lit mosquito buster would work. Although I had miniature black clouds of bugs around me, none landed on me. I was relieved it actually worked because I didn’t take any backup system. The only thing that concerns me is the smoke it emits and when the wind shifts, you inhale it. Can’t be good for you with all the poison warnings on the wrapper. Deliverance strayed from the trail only for brief moments. He came back on recall every time. 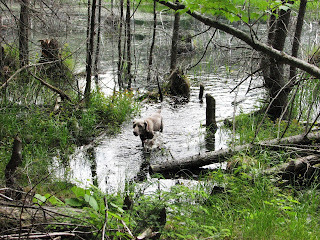 Although Zoey Pearl dove right into the marsh and swam around its murky waters, D played it safe and only followed the shoreline getting just his paws wet. He was content just exploring the bush. I read, read again and read some more. Need a change of pace from Anne Rule’s true crime novels. I’ve now read so many murder scenarios I have a bit more thoughts for my own book (totally fictional). What I have noticed from the more recent books she has published is the word smithing aspect of her writing. A lot of the unusual choices of words she uses I have never heard. Still I like a challenge to investigate her variations of choice in describing things. It is part entertaining for me to read her work and part educational. She has some wonderful ways of describing her characters and scenes.I never have time to just curl up with a good book so this is my chance to do it. Dinner was heavenly with Chicken Alfredo and a side salad. I topped it off with a cup of tea before taking the dogs for a walk over to the boat launch. A couple of ducks quacked their hellos from the middle of the lake. Zoey Pearl was wishing they could just swim a little closer so she could retrieve them. No luck I’m afraid. D showed some interest in them as well but his fear of a vanishing lake bottom prevented him for even entertaining the idea of fetch. 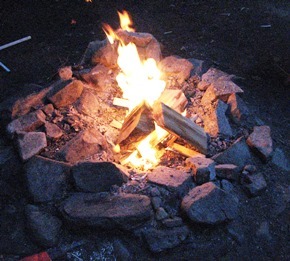 I resumed reading again getting the fire pit ready for my evening blaze of flames and orange ambers. I have another movie to put on. The natural light is slowly drifting off into dusk so I will return to my camp fire and evening entertainment. D is sleeping on his mat beside my chair and the campfire. It’s been a busy day for all of us. Tomorrow I’m off to find fuel for the truck that is getting very thirsty. I hope the gauge is accurate and I make it to Minden ok. I should have left Orono with a full tank instead of half a tank like I usually do. Stupid, stupid, stupid me. Years ago we got stranded with Big Blue our other medium duty towing vehicle. We had the six horse trailer full and were heading home late from a horse show. There were no gas stations opened so we were hoping we could make it. That didn’t happen. We were stranded on the side of a lonely very dark road. It’s a long story, but one thing you never ever do, is let a diesel truck run empty. You can’t just put fuel in the tank and turn the key. It is a very complicated and expensive process to get the truck running again. I should know better. I had a horrible sleepless night. I thought I had forgotten to pack my sleep meds. I have a very disturbing sleep disorder that was diagnosed several years ago at a sleep clinic. I need muscle relaxers to send me off into deep sleep. Otherwise I am just under the surface and awake to the slightest noise of bit of light. Last night I tried in vain to fall asleep. Usually reading helps but not last night. I can tell you how a night in the forest goes from dusk to dawn. There was an annoying bull frog that kept bellowing all night. You could time his croaks. About every 20-30 seconds he would inflate himself and burp out his call. I was tempted to find a fishing net and flashlight. It would have been great to scoop him up and move him to the other side of the lake. The hours ticked by, 1:30 am, 2 am, 3am, 4 am, 5 am. By this time the sky started to shed its curtain of night and allow the new day to emerge. Birds started to sing and the bull frog finally accepted his laryngitis and was quiet. By 6 am the work trucks of the day started rolling in. I finally got to doze off into a light sleep. I hate that type of sleep. I always have nightmares when that happens. I dreamt that I was lost and couldn’t find my way home. I walked for hours on deserted streets looking for anything familiar. I’m sure my feet were walking in my sleep as the dream took on a realistic hopeless feeling of abandonment. I was struggling when I finally awoke at 9:30 am. A light sprinkling over the tent signaled rain. By chance I found my pills in my clothing bag. Tonight I will take one. After a short simple breakfast of English crumpets and a cup of coffee, I fed the dogs before taking them for the morning constitution. 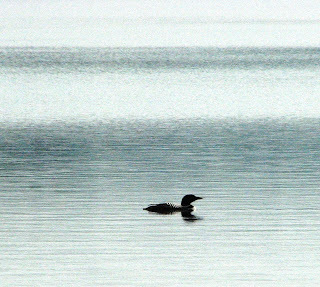 A lone loon stationed itself in the centre of the lake. 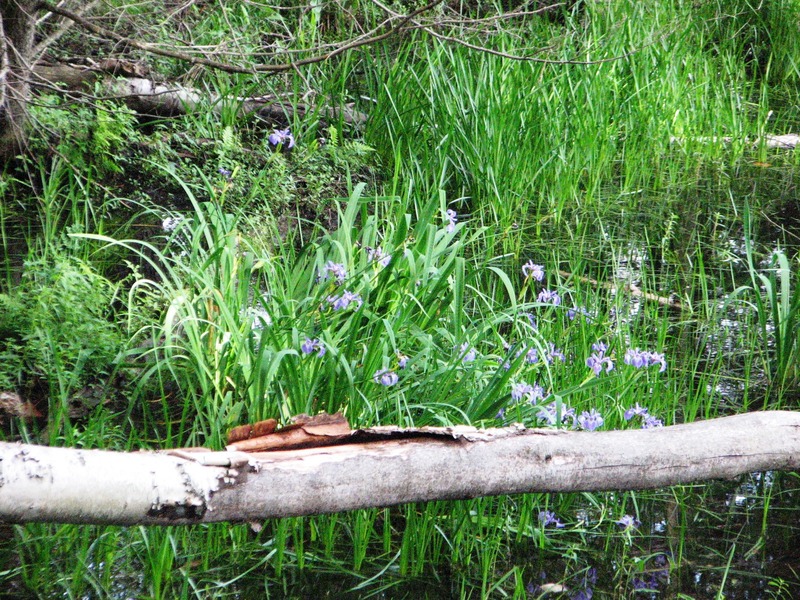 It was a magnificent icon of the forest and wetlands. How majestic it looked in its solitary moment as it paddled and drifted with the slow moving currents of the lake. The truck was packed and I rolled out of the site with great impulsion. The hill is loose fill and steep. Toot (my truck) doesn’t care for the terrain and protests with spinning wheels as it snakes it way up. The speed has to be sufficient or the dual tires dig ruts into the path of travel. It is dangerous to boot it up the hill as there is a bend in the main road just where my drive exits. I did have to slam on the brakes at the top of the incline. Sure enough a truck was coming around the bend. Off we drove cautiously with a fuel deprived tank. I turned off the air condition and rolled the windows down. I slipped my foot of the gas pedal going down hills to save fuel. I keep the speed moderated as I followed the windy and hilly road to West Guilford. When I reached the small village of unmentioned population, I rolled into the only gas station hoping they would have diesel fuel. They did! I put $150 in the tank and the gauge read full. I could relax now and drive more at the speed limit. On to Minden we went. After a brief stop of the Canadian Tire Store, I headed back to camp. The gas gauge dropped to just under ¼ tank. It must be the hills that eat the fuel like candy on a Halloween night. As usual Taboo draws a crowd wherever we go. Not too many people are used to seeing two large dogs, a parrot riding shotgun and an old lady driving a big medium duty truck (not a pick up) with a train whistle. I got a lot of waves and comments. This time was no different. The gas attendants just had to tell how wonderful it was to see such a lovely bird go camping no less. They were both stunned and amazed. Taboo drew similar attention in the Canadian Tire parking lot. “Is that a Cockatoo?” one gentleman asked. I responded to the affirmative. “Beautiful bird!” he exclaimed as his eyes sparkled in amazement. “Thank you and yes he is quite the bird.” I responded. Little do they know the story of Bruiser eh. Back at camp I settled back into my book and finished it. The noise from the road is annoying with many cars and trailers rolling by. It is a disadvantage being so close to base camp. You get all the traffic coming in. Then two sites down there is a young family with a very yappy little dog. Mine are angels with just the occasional bark at passersby. Even Taboo is silent. Then a chain saw groaned away. That damn bull frog was at it again. I finally resigned myself to the fact I had no control over the volume of disturbances, so I retired to my tent for a while. A quick shower lasting 20 minutes brought some relief from the mugginess of the day. Steam rose from the sandy soil as tall cedars kept an umbrella over my picnic table. It was the only thing more or less dry. Tonight I treated myself to a rib eye steak. Ummm Ummm good. I washed it down with a glass of Merlot. I eat better on vacation than I do at home. Must be something in that campfire smokey air that plays havoc with your senses of taste and smell. I started a campfire to dry my chair out after a late afternoon rain. It is starting to mist over again with a dash of moisture falling from the skies. I have my rain coat hanging over my computer right now to protect it while I dash in a few more keystrokes. The dogs have had their evening walk. The noses pressed hard to the dirt like a hound dog on a scent. I’m ready to settle down to a movie by the fire. It will be an earlier night tonight as I roll into my bed for a long dreamless night. D will join Zoey Pearl in the truck tonight with Taboo. He’s a good boy, but he takes up a lot of room on my Queen size bed. Often he sleeps where I stretch out. So for tonight I will be dogless in my tent. Don’t worry, I keep my keys with me and if some marauding creature should sniff around my tent, I can use the truck alarm to frighten it away. Besides, I know that the two dogs in the truck just a few feet from my tent with also sound alarms. My campfire was short lived last night. The firemen arrived from above and doused the roaring flames that engulfed the logs in my rock fortress. I took cover in the truck after gathering all the delicate electronics and putting them in dry shelter. I then finished watching my movie in the comfort of “Toot.” The rain had lifted by the time I entered my tent for the evening. I grabbed my little pill so I would finally have a good night’s rest. After 20 minutes of reading, I could feel the effects and decided it wouldn’t be long now before I melted into sleep. I turned the last page and closed my book. I extinguished the lamp and rolled over under the covers. Morning came with a bit of sunshine to smile on the day. When I emerged from my sleeping den, the earth was damp. My carefully dried out chair was once again soaked in rain. Where to sit? Then I had a light bulb moment and put on my rain gear. At least my jeans and underwear would stay dry. Today I have a number of things planned. I’m going to the Wolf Center and see how the remaining wolves are doing since that terrible night on New Year’s Eve when some idiot or idiots decided it would be fun to release the captive wolves into certain death on the loose. It was a well-orchestrated plan. It was obvious from police investigations that the person or persons unknown had studied the compound and patterns of employees. They chose to cut the outer perimeter fence which at one area meets closely to the inner containment fence. Their cut created a large gap for the wolves to escape. To summarize, after weeks of trying to locate, live trap and/or entice them back into the compound with food, two of the mature wolves were shot to death and left on the roadside. A couple of more seemed to have survived the winter. The sad part of this whole event was that the young wolves from last year’s litter were left alone to fend for themselves. Although not confirmed, they believe this was the work of an animal rights group who obviously decided that death by a car hit, starvation or wounded by bullet only to die an agonizing death was better than living wild in a controlled environment of a large natural compound were their pack lived in harmony. This world renowned research center into wolf behavior and education suffered a terrible loss. Criminal charges are pending on anyone one of these culprits found responsible. 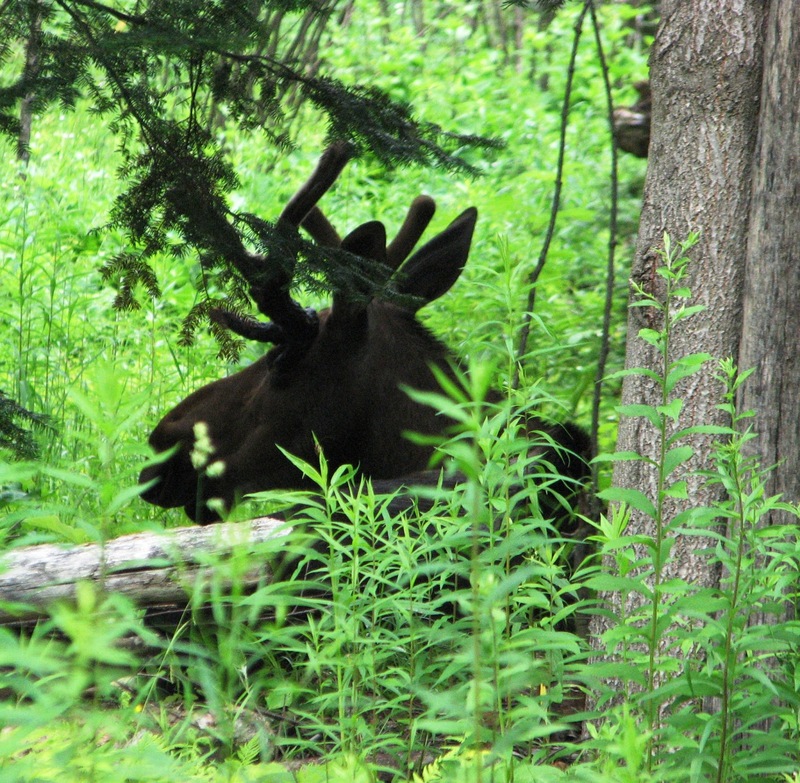 I also want to take a look at the young moose they are waiting to release back into the wild. It has lost an antler. Hopefully as it grows, it will be able to cope with life in the woods and be able to protect itself from predators. I took the dogs for their walk strolling by the campsite I had last year. It is occupied with a large trailer and other such amenities. I think it must be leased now. Too bad. I really liked that site. I drove to the Wolf Center and spent at least an hour. I talked with the tour guide and discovered a little more to the story that developed on New Year’s Eve. To begin with, no suspects have been arrested but the case is still on going with the OPP. The two wolves shot were just a few yards from the main gate of the enclosure. Although not known for sure, strong suspicion is that a local trapper who has a license for wolf took them down. The only thing illegal was that it was in a protective animal reserve. He has not come forward for obvious reasons. The one female wolf survived for a 2 weeks before they found her near death on the side of the road. Although all attempts to save her by a local veterinarian proved fruitless. She died 48 hours later. She had sustained two gunshot wounds. The one alpha female has not been seen. Whether or not she survived the winter is purely speculation on anyone part. Lone wolves very rarely live long without a pack for protection and socialization. I had the guide identify my wolf pictures from last summer. Poor Haida (black wolf) is the one lone wolf still missing. The other wolf Grissom died sometime after this photo. The surviving pack is down to just four wolves and no leaders. They are looking for a western timber wolf male to introduce to the pack. They want to continue their research and educational work here and now to rebuild the breeding program. I learned more about the incestuous family life of the wolf and why packs are so distinct and separate. Did you know in the wild a wolf’s personal space is 50,000 acres of territory it calls its own and defends it. I can’t imagine we would ever be over populated with wolves given this fact. On the way back I went in search of Hershey, the young moose in captivity soon to be released. After a bit of scouring the brush in its super large enclosure, I found him resting near some trees. As you talk to him, it is obvious he is use to human voices and appearances and visitors. The wild side of him hasn’t come out yet and that’s a good thing. Since he is still an adolescent, it is probably safe to be around him. At the same area a group of hogs rested in their pen. Like Hershey, it is a very large pen with shelter. Two piglets came over to investigate my camera. I just had to name them Fred and Barney. (Fred being the white pig and more assertive with Barney the red spotted pig as the devote follower.) The large sow I named Wilma. So the whole Flintstone family with the rock rubble fence live next close by the Hershey. When I arrived back camp a family of ducks paddle by my tent. A moma duck, a daddy duck and 8 little ducklings stayed in formation as they swam around the shoreline. Now this was really testing Zoey Pearl’s patience. She so badly wanted to go in and retrieve them. D looked on with great interest as well. But D is more of the Sherlock Holmes type dogs. He has to access all scenes of possible crime before he makes a decision. Besides he has overcome his reluctance to just dive in. Off to the boat launch with the dogs for another brief visit. 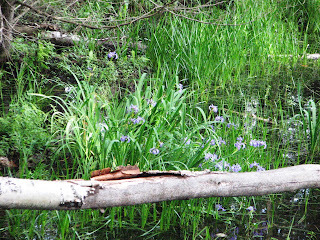 I took along my camera this time as I wanted to get some photos of the wild iris in the water. I managed a few snaps of Zoey and D as well. Tonight’s menu was meatloaf and garlic potatoes. I have to start gathering things up for my packing tomorrow morning. I took the dogs for one last swim down at the launch. A group of young teens and a couple of camp counselors supervised them. Zoey Pearl was in her element. There were lots of people to throw sticks for her in the water. 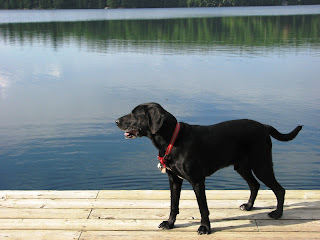 Time and time again she propelled herself into the water like a torpedo chasing that sometimes elusive stick. She made a big splash off the end of the dock bringing a whale of cheers from onlookers. She totally submerged before rising to the top and swimming like mad to get the object of her obsession. D on the other hand was just content receiving all the pats from strangers. No way Josie was he chasing a stupid twig in deep water. Got to be nuts to jump off a dock! My last camp fire roared to life as I hunkered down into my chair and watched a movie. Soon the evening would wrap its arms of stillness and dark around all things visible. I kissed the sky goodnight and fell fast asleep on my lovely bed and surrounded by flimsy nylon walls and mosquito netting. I awoke to a bright sky and sunshine. Now it was time to hustle and pack all things away in the storage bins onboard Toot. With everything finally secure, I did one circle truck inspection before climbing into the air ride seat and turning the ignition. Off we went heading down to West Guilford where I was to meet Kaleigh and drive her back to the farm with me. After a healthy feast of bacon and eggs, coffee and toast, we climbed into the truck and made our way south. I was really looking forward to having a refreshing shower, washing away the remnants of wood smoke, perspiration, and just plan dirt. A week in the woods can make your skin crawl so it is such a treat to have a good cleansing. Amen to another year of camping.